Unless otherwise noted, the data presented throughout this Web site reflect EPA’s 2003 modeling and analysis of the Clear Skies Act of 2003. Clear Skies legislation was intended to create a mandatory program that would dramatically reduce power plant emissions of sulfur dioxide (SO2), nitrogen oxides (NOx), and mercury by setting a national cap on each pollutant. The Clear Skies bill was proposed in response to a growing need for an emission reduction plan that will protect human health and the environment while providing regulatory certainty to the industry. The proposed legislation for air regulation never moved out of the Senate Environment and Public Works committee in 2005 and was therefore never enacted. "My Clear Skies legislation will cut power-plant pollution and improve the health of our citizens. And my budget provides strong funding for leading-edge technology, from hydrogen-fueled cars to clean coal to renewable sources such as ethanol. Four years of debate is enough. I urge Congress to pass legislation that makes America more secure and less dependent on foreign energy." Comprehensive technical analyses of the 2003 legislation. Clear Skies legislation would create a mandatory program that would dramatically reduce power plant emissions of sulfur dioxide (SO2), nitrogen oxides (NOx), and mercury by setting a national cap on each pollutant. The Clear Skies bill was proposed in response to a growing need for an emission reduction plan that will protect human health and the environment while providing regulatory certainty to the industry. 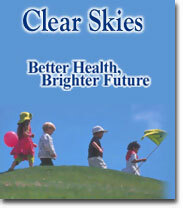 Where You Live  Descriptions of the health and environmental benefits of Clear Skies in each state and EPA Region. Basic Information  Purpose and goals of Clear Skies, as well as a summary of the design of the program and the benefits it would provide. Health and Environmental Benefits  More detailed information on the benefits of Clear Skies, including links to technical information. Economic and Other Impacts  Compliance costs and related impacts of the emissions caps on affected sources, and links to technical background material. Legislative Information  Status of Clear Skies legislation, including links to the legislation, Congressional testimony, and related documents. President's Message  July 1, 2002 message from former President George W. Bush describing the benefits of Clear Skies. Technical Information  Complete "Technical Support Package for Clear Skies" and links to related information. Related Links  Links to relevant EPA programs and information.